Sometime back, I was participating in a training in Spiritual Accompaniment. During the days of training we also had ample time for personal prayer and reflection. One of the meaningful discoveries that I made during that week was to pray by just doodling. After every period of prayer, I would make some pencil drawings to relive my moment of prayer. I realised that these ‘childish’ drawings helped me a great deal in deepening the feelings that I had experienced during prayer. I discovered that, perhaps, doodling could be a non-verbal expression of the process of integrating our thoughts and feelings. In the gospel passage of today we see Jesus writing on the ground, in a manner that could be considered very similar to doodling. I would like to centre my reflection around this sentence from the gospel text of today – the 5th Sunday in Lent: “But Jesus bent down and started writing on the ground with his finger” (Jn 8:6). We would try to answer two possible questions: what could that gesture of bending down and writing on the ground signify? And what could have been the likely content of that writing? This is not meant to be a scholarly analysis of the sentence, but only an analogical reflection, to evoke a certain feeling in us. May be, this will help us get in touch with the deeper meaning of the text. In the whole Gospel of John, we see Jesus visiting the temple of Jerusalem three times, coinciding with the three years of his public ministry. The event narrated in today’s gospel text forms part of his second visit to Jerusalem for the feast of the shelters or booths (Jn 7:2,10). In the middle of the festival (Jn 7:14), Jesus goes to the temple and begins to ‘teach’. The leaders of the Jews wonder, “How did he learn to read? He has not been educated” (Jn 7:15). Jesus claims that it is God Himself who taught him. There follows an argument, and the Law of Moses becomes the bone of contention. The Pharisees are infuriated, they want to arrest Jesus. And it is “Nicodemus – the same man who had come to Jesus earlier – said to them, ‘But surely our Law does not allow us to pass judgement on anyone without first giving him a hearing and discovering what he is doing?” (Jn 7:50-51). Then they all go home. Jesus himself retires to the Mount of Olives. This mount was seen, in the Old Testament (Zech 14:3-4), as the scene for the last judgement. Early next morning, at daybreak, Jesus appears in the temple, he sits down (‘ex cathedra’) and again begins to teach (Jn 8:2). Meanwhile, perhaps at night, a woman had been caught in the act of adultery. As per the Mosaic Law (Lev 20:10; Deut 22:21), she is to be stoned to death. However, during the time of Jesus, the Romans were attempting to impose their rule of law on Israel, withdrawing the authority of the Sanhedrin to inflict capital punishment. So the leaders of the Jews bring the woman to Jesus. Jesus is nominated as the judge. But it is also a trap. Jesus, proactive as he is, uses this trap to teach a powerful message to them then – as He does to us now. He “bent down and started writing on the ground with his finger” (Jn 8:6). Perhaps, he is mimicking a Judge. May be, he is reminding them that, just as the finger of God wrote the ten commandments on the tablets of stone, he, as the Son of God is rewriting the Law. In any case, against the background of my own experience of doodling during prayer, I would like to suggest that Jesus was doing something more symbolic. Jesus bent down – bending down could be a symbol of humility; and doodling, as I said, is an act of integrating our thoughts and feelings. Therefore, I would like to think that Jesus was inviting the scribes and the Pharisees towards an act of introspection, a process of soul searching. Jesus is inviting the accused woman to do the same. Yes, on this 5th Sunday in Lent, Jesus is inviting us to humbly bend before our God and do a soul-searching. What was Jesus writing on the ground? There are many suggestions: most traditionalists think that Jesus was writing the sins of those men who stood at the scene with stones in their hand. Some feminists might suggest that Jesus actually wrote a question on the ground: “Where is the man?” Because, the same texts of the Law (Dt 20:22; Lev 20:20) that speak about stoning the woman caught in adultery also say that a man caught in adultery with the wife of another man, deserves the same punishment. However, against the background of the Gospel of John, I would like to think that Jesus wrote two words on the ground: Grace and Truth. The evangelist John, in his prologue to the Gospel, which is like an overture to a musical, says, “For the Law was given through Moses, grace and truth have come through Jesus Christ (Jn 1:17). To me, this is one of the central themes of our Christian faith – a theme that has been so powerfully demonstrated in the gospel-story of today. The scribes and the Pharisees want to condemn the woman using the Law of Moses, but God in Jesus wants to embrace the woman in his Grace and Truth. In a sense, Jesus invites the Jews to look at the core of the Law, as they were reminded earlier by Nicodemus (Jn 7:50-51). 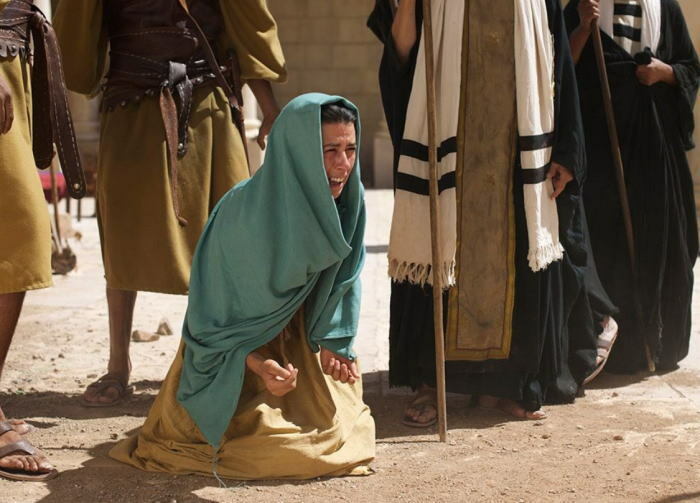 Jesus offers also the leaders of the Jews a possibility to experience this Grace and Truth: “Let the one among you who is guiltless be the first to throw a stone at her” (Jn 8:7). This invitation to experience the Grace of God comes as a moment of Truth to those men: “When they heard this they went away one by one, beginning with the eldest” (v.9). The light that enlightens the path of some also exposes the shame of others. The presence of Jesus, the Light (Jn 8:12), makes those who justify themselves to become ashamed and unable to respond to the grace of God; the same light becomes a moment of embracing grace for the condemned. Earlier in the Gospel of John when Jesus talks to Nicodemus, He says, “For God sent his Son into the world not to condemn the world, but so that through him the world might be saved” (Jn 3:17). This becomes so true for the accused woman, in the gospel story of today. Jesus asks her, “Woman, where are they? Has no one condemned you” (v.10)? Then Jesus invites her to experience Grace and Truth (v.11): “Neither do I condemn you” (Grace); “Go away, and from this moment sin no more” (Truth). She, who was brought to Jesus as to a Judge, finds in Him a Saviour. She, who was at the verge of death, receives a new lease of Life. She, who perhaps was a victim, now has to take responsibility for her own choices. This is what our Lenten journey is about. It is a moment to experience the Grace of God. It is a time to rejoice in the saving justice of God (Rom 8:33-34). It is moment to look at the Truth about ourselves. It is a time of soul-searching. As St Paul tells us in the 2nd reading of today, “All I can say is that I forget the past and I strain ahead for what is still to come; I am racing for the finish, for the prize to which God calls us upwards to receive in Christ Jesus” (Phil 3:13-14).